Kudos to you on graduating top of your class. Off to law school? Business school? Medical school? How about choosing none of the above and opting instead for a Steeltown start-up? Your parents may not approve but author Andrew Yang would congratulate you on a smart career move. And the rest of us here in Hamilton might just throw you a parade. Yang is founder and CEO of Venture for America (there’s also a Venture for Canada for top grads north of the border). He’s out to create an army of company builders with a sense of purpose. His non-profit enlists freshly minted grads south of the border to join start-ups and help revitalize cities and communities through entrepreneurship. Right now, the best and brightest aren’t flocking to start-ups. They’re taking the lucrative and well-traveled path to work as bankers, lawyers, consultants and doctors in a handful of major cities. We’re witnessing a hyper-allocation of top talent flooding professional service industries. While it’s easy to see the upside, Yang cautions there’s a downside that too many grads ignore. “If you work in professional services, you will be paid handsomely and have a brand-name firm on your resume. You’ll gain skills, confidence and exposure. And should you find yourself bored, burned out or out of a job, Yang says it’s often toughen than anticipated to change careers. The work will be gritty and unglamorous. Yet you’ll learn how to get things done. You’ll be comfortable making decisions working off limited knowledge. You’ll create and improve products. You’ll know how to win and keep customers. And you’ll discover what it takes to hire, manage and lead a team. Along with creating those hands-on learning opportunities, Venture for America provides training, networks and support for top grads who are working with start-ups in cities like Detroit, New Orleans and Cleveland. So if you’re headed to a spring convocation cermeony, skip the obligatory copy of Oh, the Places You’ll Go! 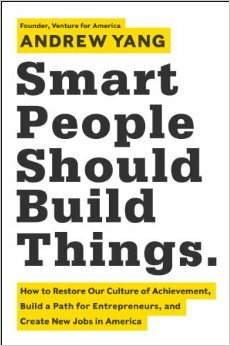 and give this book instead to your freshly minted grad. And be sure to highlight one of Yang’s favourite quotes from an unknown source on page 68. This review first ran in the April 14 edition of The Hamilton Spectator. The reopening of the Royal Connaught will kick downtown renewal into overdrive. For a preview of what’s in store, look 1,300 kilometres south to Greenville, South Carolina. Like Hamilton, Greenville had a landmark hotel that had fallen on hard times. Boarded up for a decade, the Poinsett Hotel was a downtown eyesore that cast a long shadow over the renewal that was happening around it. In 1989, Greenville residents were asked to name a great downtown. Less than five per cent chose their hometown. The hotel reopened in the Fall of 2000 and $65 million worth of commercial and residential investment in the two blocks surrounding the hotel soon followed. The Westin Poinsett joined a new performing arts centre and stadium as downtown anchors. The ballpark, home to a Boston Red Sox farm team, was built with no taxpayer money and drew 330,078 fans downtown in its first year. Connecting the hotel, arts centre and stadium are more than 90 restaurants and pubs plus high end retail. To give the downtown a personality and a reason for pedestrians to keep walking the next block, Greenville doubled down on public art. Donor-funded bronze sculptures of local heroes and nine mice hidden throughout downtown are a crowd favourite. The business-first city council has held firm on its commitment to historical preservation, private-public partnerships and mixed use development in the core. Since 1999, Greenville has added 1,000 housing units downtown. Underused parking lots have been sold to developers who commit to putting up buildings that offer a mix of office space, restaurants, retail, condos and apartments. Renewal has been 30 years in the making and didn’t always come easy. “Every success met with battles and very public opposition,” says Boyanoski. There was pushback on everything from narrowing Main Street from four to two lanes of traffic, widening sidewalks and knocking down a four lane concrete bridge built over a downtown waterfall. The unobstructed falls, with a 23-acre park and pedestrian suspension bridge in the heart of the city, is now Greenville’s main attraction. The city also took on a night club developer who planned to fill a prime piece of real estate with billiard tables and video poker machines. 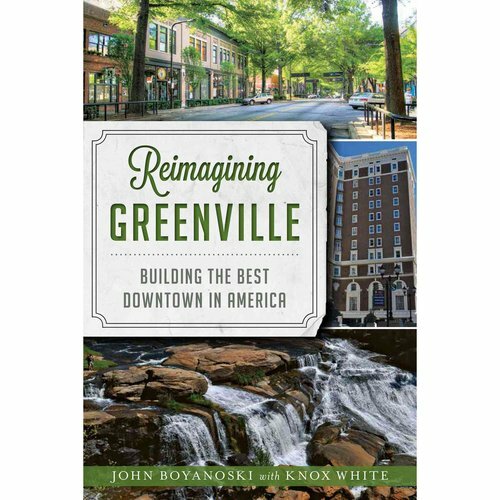 “Greenville’s road to getting and retaining retail started with a lawsuit, one of the nastiest in city history,” says Boyanoski. Today, the building is home to Mast General Store and jammed with customers. Above all else, Greenville has been blessed with strong mayors, a committed council and city staff at the top of their game. They’ve followed through on a consultant’s bold blueprint to make downtown Greenville everyone’s neighbourhood. Three things will happen after reading this book. You’ll want to take a 13 hour summer roadtrip to Greenville, stay at the Westin Poinsett and catch a ballgame. You’ll gain a new appreciation for what downtown renewal means for all Hamiltonians and what’s required to make the core everyone’s neighborhood. And when you step into the voting booth Oct. 27, you’ll cast your vote for strong and visionary local leaders who have the courage to stay the course and not lose sight of the big picture.